Arthur Hatton is a connoisseur of music and the founder of Linescratchers, a site that highlights LDS musicians who play music other than LDS-themed music. We’re pleased to have him as our guest for a special series of posts. Last time I talked about the spooky, yet technically proficient Halloween tunes of Kristen Lawrence. Now we move to a friend of mine through Linescratchers, who is just as well known for what he’s done with our music scene (he has played and is playing with several well-known bands) as he is for what he’s put into it. Gregg Hale has done it all. 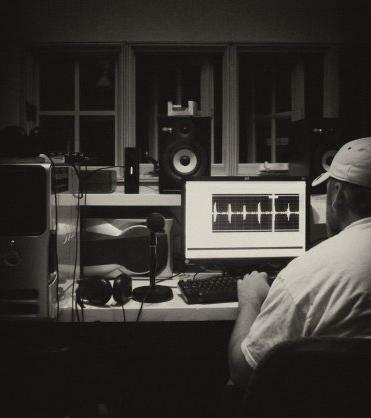 He’s a producer, studio and record label owner, engineer, guitarist, battle-of-the-bands judge, and all-around nice guy. Music wasn’t his first choice, though. Born in Idaho Falls, his whole family was musical: his sisters all sang and his father sang folk music (and still sings in a group called The Not Brothers). However, in high school, Gregg seemed more interested in basketball and football than playing music. In his senior year, that all changed after he first heard the album Purple by the Stone Temple Pilots. Soon, he was listening to all kinds of ’90s alternative rock, and after he bought his first guitar, the rest was history. Gregg played in several bands in the mid-to-late ’90s, but his first real break came in 1997, when he was just 20 years old, when he was approached by some members of the multi-platinum British band Spiritualized to play guitar with them on their live tours, supporting their critically-acclaimed Ladies And Gentlemen We Are Floating In Space. After playing with Spiritualized through 1997 and 1998, Gregg left the group and moved back to the United States. He spent a few years working for Arista Records as an A&R rep (one of the most thankless jobs in the industry I think), and settled in his current home in Salt Lake City. It is in Salt Lake City that Gregg has decided to give back to the musical community. He started the Handsome Rob Records label and the Lincoln Street Sound Studio in Salt Lake, recording many artists from the area and offering advice and encouragement. He has recorded music there for Fox and the Fox Soccer Channel. He also judges local battle of the bands contests to help up-and-coming bands in the area. Gregg spends all his time in all these endeavors helping local bands in Salt Lake City refine and perfect their music. But that doesn’t mean Gregg has stopped playing. He currently plays guitar with two quite different indie bands in Salt Lake City. One is Last Response, responsible for, among other things, the tight pop-punk album Have You No Sense Of Direction and awesome songs like “All Things” and “NYC”. The second band he joined in Salt Lake is the slightly more experimental Our Dark Horse. He recorded one of their albums, and later two of their guitarists precipitously moved out of town, so they brought Gregg into the band. How does Gregg view his music in terms of his faith in God? “It has shaped most everything about who I am, and what I try to be with my life. As far as my music, I suppose I have always just tried to make music that I would not be ashamed to have my grandma listen to, or to have the Lord hear it. Not necessarily music that Jesus might go out of His way to listen to, but nothing He would be disappointed with. I suppose a combination of that and getting older has led me to expand on my lifelong love of instrumental music by listening to stuff like as Brian Eno, Sophorus, Eluvium, Amina, M83, and Stars of the Lid. I can listen to that stuff all day, and my grandma could probably listen and politely nod her head and say, “that’s not bad”. When I first saw Gregg’s name on the Famous Mormons website and Wikipedia, I knew I needed to interview him for Linescratchers. However, as we talked about my project, he eventually agreed to join Linescratchers as a music reviewer and a blogger. Gregg’s a great guy and if you want to read more from him, just keep checking back at Linescratchers. And for you musicians in the Salt Lake City area, Gregg is a good person to know. He regularly listens to, advises, produces, and records local bands, and, with touring experience and as a former A&R rep for Arista Records, he knows exactly what bands need to do to be successful. You can get in touch with him on the MySpace page for Lincoln Street Sound Studio. This is great. Thanks for the pointer. Thanks Gregg. I guess you don’t want anyone to think that you graduated early from your mission. I was actually a missionary when I first met the band in Liverpool. That’s a lesson for you kids… I put off music for 2 years, and while a missionary, I was able to make my most significant connection as a musician. Quit pointing out my flaws Gregg! Somehow I missed this post. I love Ladies and Gentlemen We Are Floating in Space. Possibly one of my fave album titles ever. Slip the judge a $20. Come out of her, my people, that ye be not partakers of her sins, and that ye receive not of her plagues. For her sins have reached unto heaven, and God hath remembered her iniquities.